Winter had been not severe but nonetheless discouraging and interminable. We needed to find a setting of warmth and sunshine. 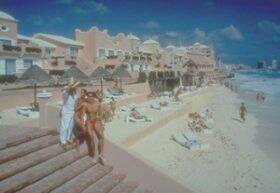 So on April 16, 1997, proceeding that vile day of national theft by which we are all tormented, we boarded a plane to take us straight south to Cancun, Mexico. Leaving behind a drizzling gloomy Michigan morning, a scant 3 plus hours later we emerged from the aircraft in bright, sunny, warm, not too humid, Cancun Airport, a small stretch of concrete carved out of the jungle. We looked forward to 6 nights and seven days of another Caribbean getaway. 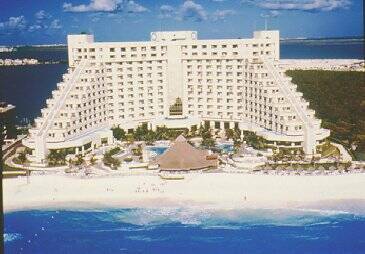 This time the objective was to just burrow in the sand of one beach and one hotel, choosing the Melia Turquesa (named for turquoise colored sea it faces) because we could get 3 more nights than was possible in the Melia Cancun located just down the beach, effectively doubling our vacation time for very little extra resources. While riding between airport and hotel we glimpsed the unbelievable color of the ocean for the first time; we knew we were in the right spot. Arriving at the hotel around 12:15 p.m. we envisioned dumping our luggage in the Courtesy Room, changing into our swimsuits and heading for the beach. That is the normal routine since check-in time is around 3:00 p.m. The hotel was crowded inside and out. The beach was obviously a happening place, and we could hear it calling to us plaintively, almost desperately, "Come and enjoy; the water and breeze is wonderful." The Front Desk was a happening place also. And the beginning of a nightmare was about to unfold. It was to wreak its havoc for only a few days, but what we didn't know was at that moment the terror was to mount incrementally over the next few hours threatening to destroy our mental and spiritual investment. The Cliff Notes version follows. After waiting over an hour for the group in front of us to check-in it was apparent that something was amiss. Upon arriving we decided we might as well check-in then rather than waiting for 3 o'clock, to save time and get to the beach sooner. The group stalling us couldn't get their room and were very vociferous in expressing their outrage. We thought "its a good thing we have confirmed reservations, this couldn't happen to us, certainly!" After two hours in line, and the group trying to locate a manager, concierge, or anyone in charge to rectify their situation, we faced the clerk with our confirmation in hand. By then and fearing the worst, Melissa located a nearby phone to call our travel agent in Ann Arbor (collect). I faced the young female desk clerk with my confirmed reservation in hand. I was told "the computer was down," checking in was not possible and was asked to come back at 3 o'clock, 45 minutes away. I fell for this line by getting out of line. After being chided by my exasperated wife I returned to the end of the line and, after another long wait found myself facing the equally exasperated desk clerk. She seemed to be getting little support by her bosses who wisely decided to remain out of sight. I told her that since no one behind me was getting a room, I was staying where I was until our problem was rectified. Meanwhile a storm of protest was erupting throughout the lobby resulting in much yelling, whistling, foot stomping and other audible indications that a riot was about to occur. The travel agent on the phone with Melissa hear the eruption and exclaimed that we must get out of there! With me now firmly planted in front of the clerk, she disappeared behind a wall and returned with what she claimed was a confirmed room for two nights at the Continental Villas Plaza up the beach about a mile. The Melia paid for taxis service to (and from) the Continental Villas and for the two night stay, telling us to come back and they will have our room for us. That seemed quite doubtful since even those in line with us were already returning from a diverted stay only to hear the same refrain, "Our computers are down, come back after 3 o'clock." They would probably be reassigned again if they couldn't find other solutions. The Continental Villas Plaza was a very nice hotel, colored outside a gorgeous deep coral pink that complimented a deep Caribbean blue sky, but our room was the bottom of the barrel. In spite of nice marble floors and walls, we had to endure a sewer smell in the bathroom and other assorted unpleasantness. Those things not withstanding, we were grateful to have negotiated a successful check-in and found ourselves finally on the beach around 4:30 p.m. the afternoon of our first day. The sun was still out only about four hours from setting, and the water still called to us and we responded appropriately with deck chair and sunglasses. I relaxed almost immediately. Melissa took much longer to unwind, as she had attempted to call local hotels for reservations for the remainder of our stay and fretted over the outlook presented to us. We booked a place for the last two days but could find nothing for the two middle nights. We weren't certain if we were going to be able to stay through Tuesday or if we would be on a flight home Friday. Would we end up sleeping on the beach for two nights to bridge the gap or would a miracle occur? Our local representative from Classique Travel somehow got us back into the Melia Turquesa after our stay at Continental. Thanking God, we were able to enjoy ourselves for the duration of our stay in spite of the rude treatment of some employees of what is a world wide resort chain, Sol Melia. The saga contains much more details and situations, but the focus of our trip was rest, warmth, and refreshment. We found ourselves lapping those up in abundance. The weather was mid 80s and the sunshine was abundant in spite of a day of rain on Monday and an evening of rain Thursday (during which we watched the red Wings win a Stanley Cup playoff hockey game, taking some of the sting out of the drizzle). We spent Sunday on an excursion to Tulum, a small Mayan ruin two hours south along the coast, and enjoyed a few hours at Xel-Ha (Shell-Ka, as they say it) which is what I would call a "snorkel park," a series of lagoons on the Caribbean coast, abundant with wonderfully colored fish and assorted snorkelers. The water wasn't as clean as one might have hoped, but for a first time snorkeler like me, it was pretty cool. After only gulping minor amounts of salt water I enjoyed surface floating and fish watching. Melissa declined the pleasure, satisfied to sit in the sun which did finally make an appearance that day as the clouds thinned out. The night life was not a major part of our agenda so we usually retired early (by Cancun standards) and left the drunken revelries to those who've had more practice and ambition. We did enjoy some local dining--Pat O'Brian's and Zuppa's (Italian) were a hit, especially the drink balancing acts at O'Brian's, where sometimes drinks stacked 4 and 5 tiers high on the waiter's heads and were delivered (the drinks, not the waiter's heads) with nary a mishap to awed patrons. If run professionally, the Melia Tourquesa could be a first class hotel. The structure was beautiful and imposing, angularly shaped like a Mayan temple, with marble being the most widely used building material, and it was not used sparingly. Decorations were tasteful, colorful plants and flowers heavily accented every area of the facility. Chairs and sofas in the public areas needed to be cleaned or replaced, but all in all, it was a nice place to stay, especially as most of one's time is spent outside in the beautiful blue winding pool, walking around the lush grounds, or laying prone in the sun on the beach. In my estimation the trip was a success. Barring certain situations and accommodations, a return could be envisioned with minor variations, but not for a number of years. There are so many other places to visit--with so little time. Besides, Melissa's new found motto is "I live to cruise," so that indicates the focus for the foreseeable future, apparently. We could be talked into a week's stay at Myrtle Beach, though, next year to celebrate mom and dad's 50th Anniversary and Family Reunion. We'd be glad to break a habit for that. There is so much more to say about our first time in Mexico: the ubiquitous iguanas; the easy currency transactions; the sun, swimming, and sea. Three and a half hours of video tape can be browsed during your visit to Ann Arbor for those who want/crave more information. We would be happy to give anyone an audience. For reservations call 1-800-I Live 2 Cruise.